Feed Nova Scotia feeds Nova Scotians in need, and reduces that need. 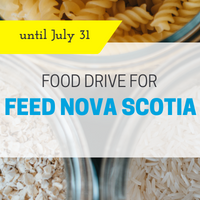 This summer, Strategic Arts Management is pleased to support Feed Nova Scotia with our 3rd annual food drive, launching Tuesday July 3rd. We are also happy to accept new, unopened personal hygiene and household items. If you can, please donate at Strategic Arts Management. You can find us at 1113 Marginal Road, Halifax, Monday to Thursday, 9:00 AM to 5:00 PM. On Fridays, donation items may be brought to the Theatre Nova Scotia office, also located at 1113 Marginal Road, from 9:00 AM to 5:00 PM. We’ll be food-driving through to July 31, 2018! You’re invited to our 2nd annual open house! We’re bringing back the Bundt cake (and more), and introducing SAM drop-ins. SAM drop-ins are your opportunity for a brief–and free!–one-on-one session with a SAM Consultant. The theme this time is paying people–from payroll to royalties, day-to-day to CRA. SAM Consultants Bruce Klinger, Nancy Morgan, and Michael Sutherland will be on-hand and open to these and other financial questions. You don’t have to be a SAM Client to attend. Strategic Arts Management (SAM) seeks an Administrative Intern for a full-time (30 hours per week), ten-week contract starting Monday, May 29, 2017 and ending Friday, August 4, 2017. Since 2007, Strategic Arts Management has been providing mentorship, management, administration, and other resources to an increasing number of artists and arts organizations at affordable, subsidized rates. The SAM Administrative Intern will support SAM staff in day-to-day operations as well as projects in sponsorship, marketing and communications, and beyond. The Administrative Intern will take the lead on the re-design of the SAM grant calendar, and will be influential in the development of the 2017-18 SAM Workshop series. In addition, the SAM Administrative Intern will work with the SAM Administrator and volunteers of the Nova Scotia Masterworks Awards Foundation to develop a 60-second promotional video and to coordinate and execute communications plans, including researching, writing, designing, and uploading content for web pages, e-newsletters, and social media. This position is funded through Canada Summer Jobs and is designed to provide training and experience in arts administration with a goal of developing resources for the performing arts sector. The successful candidate will gain career-related work experience in administration, database management, sponsorship, event planning, marketing and communications. The Administrative Intern will be paid $10.85 per hour and work from SAM’s downtown Halifax location. The ideal candidate will be a post-secondary student in a marketing, public relations, or arts administration program, with a demonstrated interest in the arts, good computer and organizational skills, excellent attention to detail, and the ability to work independently as well as under supervision. Knowledge of French is an asset. Strategic Arts Management recognizes that diversity fosters a rich and creative environment. Members of minority groups are highly encouraged to apply and self-identify within their application. Email your resume and cover letter by 11:59 PM, Sunday, May 14, 2017, to admin@strategicarts.org. Please submit your application as a single document (PDF preferred), and title your email “Administrative Intern Application”. Interviews will be conducted on Tuesday, May 23, 2017, for a position start date of Monday, May 29, 2017. Only those selected for an interview will be contacted. This special two-hour SAM workshop incorporates elements of our popular Ready, Set, Tour series in one convenient masterclass. You’ll explore the resources you’ll need to tour near and far, and delve into the details of budgets, contracts, marketing materials, and more. Led by SAM Consultant Gillian Reid. A two-phase program of one-on-one mentorship sessions with a SAM Consultant for artists and arts organizations preparing their project for the touring market. You don’t have to be a SAM Client at this point! The SAM Tour Readiness Program is offered alongside SAM subsidized hours and SAM workshops. The SAM Consultant and SAM Client evaluate the client’s existing capacity to tour. The SAM Consultant identifies areas for development. The SAM Consultant breaks down areas for development, for execution by the SAM Client. The SAM Consultant mentors the SAM Client throughout the work and with a series of one-on-one meetings. The full, two-phase SAM Tour Readiness Program is available to eligible new and existing SAM Clients at a cost of $500 per project (plus tax and material costs, where applicable). For more information, and to register, please contact Bruce Klinger. I’m new to finance. What is an expenditure? I’m a board member. What are the indications that the organization I volunteer for is financially healthy? Your Questions Answered is a unique series of SAM workshops, where your questions are the only agenda. So. What do you want to know about non-profit finance? Led by SAM Consultant and Director of Internal Operations Bruce Klinger. Getting Social (Media) is your guide. This SAM Workshop will introduce the languages and systems of social media and outline the pros and cons of popular apps and websites. In one hour, you’ll be prepared to decide where you should be online, and motivated to get going. Plus! SAM Consultant Kayleigh Sheehan will share her favourite—and practical!—tips for maintaining momentum. Led by SAM Consultant and Administrator Kayleigh Sheehan. Halifax, NS – Strategic Arts Management (SAM) is pleased to announce a new management structure and leadership. Beginning September 2, 2014, Bruce Klinger and Mary Elizabeth (M.E.) Luka will share the executive leadership position as Director of Internal Operations and Director of External Relations, respectively. Both have worked as service providers with SAM for many years, and have deep roots in Nova Scotia’s arts community. This structure will permit each of them to continue working on existing projects, while providing SAM with a wealth of skill and experience. “The Board of Directors is thrilled that we have a team that brings such a breadth of skills and depth of experience to the managing and marketing of the arts in our community”, says Dianne Milligan, Chair of SAM’s Board of Directors. A founding consultant with SAM, Bruce Klinger was Neptune Theatre’s General Manager from 1988 to 1998 and went on to assist in the creation of Theatre Nova Scotia and to develop an extensive arts consulting practice. In 2009, Bruce started Valley Summer Theatre. With more than thirty years of arts management experience, Bruce has developed expertise in financial management and strategic and business planning. M.E. Luka is an internationally-published scholar and an award-winning digital media producer and director, with more than twenty years of experience in media and non-profit management and consulting. She has developed strategic plans and partnerships with several clients, including the Canada Dance Festival and the CBC. Currently a Vanier Canada Graduate Scholar and doctoral candidate at Concordia University, M.E. teaches part-time at NSCAD and Mount St. Vincent Universities. SAM thanks co-founder and outgoing Executive Director, Barbara Richman, for her incredible vision, leadership, and commitment to the organization, which she has led since 2007. SAM also gratefully acknowledges Gay Hauser’s dedication and experienced contributions as Interim Managing Director. Barbara and Gay will continue to support Nova Scotian arts organizations as service providers with SAM. Strategic Arts Management is a groundbreaking, not-for-profit provincial service organization that supports Nova Scotia’s arts professionals and arts organizations in the management and development of their operations through subsidized consulting, mentoring, workshops, export activity, and research. SAM’s clients include creators, producers, presenters, festivals, service organizations, educators, and arts award foundations and trusts. SAM is proud to help grow and enrich the cultural life of the province and to support our artistic community in the ongoing development of exciting and compelling work of regional, national, and international renown. Strategic Arts Management, Nova Scotia’s leading arts management and resource centre, invites applications for the position of Executive Director. Strategic Arts Management (SAM) supports Nova Scotia’s artists and arts organizations who represent the rich diversity of the Arts practiced in Nova Scotia. Established in 2006, SAM has been serving an increasing number of clients with top quality mentoring, management, and administrative resources at affordable, subsidized rates through a diverse programming mix developed for client needs. SAM’s broad range of resources assists artists and arts organizations in creating and disseminating their work. Reporting to the Chair of the Board of Directors of Strategic Arts Management, the Executive Director holds the key leadership position in the organization. Guided by SAM’s mission, vision and community values, The Executive Director will maintain an institutional culture that balances the diversity and richness of the Nova Scotian performing arts milieu with the efficacy of best business practices, fiscal accountability and institutional impact. The Executive Director is responsible for the overall operations of SAM and its day to day management. This includes budgeting, financial planning and reporting, the delivery of client services, fund-raising, project management, policy development, liaison with government agencies and foundations, and the hiring and supervising of staff. Strategic Arts Management is a well-run, fiscally responsible, healthy organization. We seek a manager with broad vision, capable of analytical, strategic, and creative thinking, and open to flexible approaches to problem solving; an excellent facilitator who can enable artists to reach their goals; a team leader who can inspire, delegate, and multi-task. However, it is also imperative that the Executive Director has had practical experience in the day to day management of smaller arts organizations and be empathetic to the issues and challenges of emerging artists and groups. The ideal candidate will have senior experience in arts management; the ability to work with a volunteer Board of Directors comprised of artists, members of the business community, and academic professionals; and excellent written and oral communication skills. Administrative ability must include competence in development, marketing, fiscal management, and grantsmanship, as well as computer literacy. A passion for the arts, an entrepreneurial spirit, political savvy, and the ability to deal well with a broad spectrum of personalities would be essential characteristics of the SAM Executive Director. Salary $32,500 -$34,900 (salary based on 80% work week) commensurate with experience. Please send resume, cover letter, and a list of references by Friday, May 16th, 2014 to: Strategic Arts Management PO Box 812, Halifax, NS, B3J 2V2, or in a single PDF to admin@strategicarts.org.